Let's not lie to ourselves; the cover of this book is downright adorable. Is it not? While I try not to judge a book by its cover, I was suckered into the adorable factor of the story. As a teenager, I was often found penning a heartfelt letter or twenty to a boy that I "loved". It was the only way to express my feelings, because at 13 no one could relate with the matters of my heart. Or so I thought. I received this book for free from the publisher in exchange for an honest review. This does not affect my opinion of the book or the content of my review. 1. This book is all about matters of the heart. Lara Jean is a girl who has never confessed her feelings of admiration to her crushes. She remains timid, shy, and content in her safe way of life. I related with Lara Jean on this level. Growing up I was terrified to try anything new, and clung to the safety of the consistent. You see the change in Lara Jean as she slowly begins to take charge of her life and finds strength in leadership roles. She makes decisions that bring new factors in her life; from the smallest decision of new Christmas cookies to even dating boys that she once deemed unthinkable. 2. Details that just don't feel realistic. While I enjoyed the story there were several parts that left me grimacing or thinking, "this would simply never happen in real life". I suppose this is a pet peeve of mine when it comes to contemporary/realistic fiction. It should be lifelike, and when an author does not portray teens, parents, or relationships correctly, I get peeved. 3. Perhaps I just don't understand sisters. I'll be the first to admit it, I do not understand the sister dynamic. I do not have a sister, only one brother. So when deep seeded issues between sisters get resolved so easily in books, I wonder. Is this simply the wishful thinking of the author? Or are sisters this quick to forgive? In the instance of the driving issue between Lara Jean and her sister Margo, I have a feeling that it was one that was far too easily solved. 4. Notable shout outs to cultural heritage. 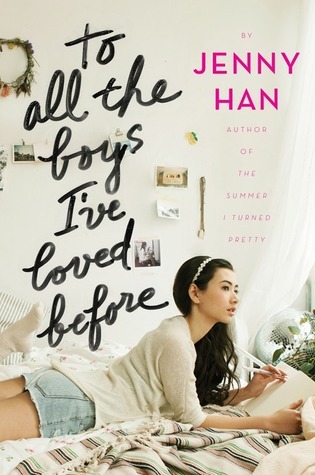 One thing I really liked was the special attention to Lara Jean's Korean heritage. Even in her mother's absence Lara Jean and her family still keep her memory alive by incorporating aspects of Korea into their everyday life. This was an okay book. From hearing other book bloggers rave about it, I suppose I expected more. The book had the set up for more content, but failed to deliver. Nevertheless, this is still a charming read. I gave this book three stars on Goodreads.